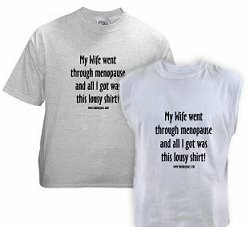 This page is for the men who are trying to understand menopause. It will include links to all kinds of information related to menopause. I love your web site Dee. You have a great take on those damn hot flashes. Women who have to face this, have their challenges, as my wife does, but the affect extends to husband and children. I have found that we men need to educate ourselves that our wives volatile emotions do not center on us and we need to learn to not add to the challenge by adding our own emotions. My wife brought me an audio tape (For Men Only, How to Love a Women Without Losing Your Mind, by Joseph Angelo), which also uses humor to point out some important stress saving strategies for men. Thanks again Dee. that claims you're a survivor too! "Hi: It is past midnight and my wife is bitching about my snoring so we looked up "menopause" to see why she cannot sleep. on the NET tonight for snoring and "night sweats". Thanks for the laugh"
"My wife and I loved your website we sat here chuckling for an hour. Male menopause is a lot more fun than female menopause. With female menopause, you gain weight and get hot flashes. Male menopause you get to date young girls and drive motorcycles or sports cars. And I love her, oh, so dearly. Since she’s acting, oh, so queerly. "Oh, it’s nothing that you’ve said or done,"
She assures me, ever sweetly. "My Change Of Life has now begun." Then, she smiles and winks discreetly. A thing that she was stating! Just what she meant by "Change Of Life"
I didn’t have a clue!? Into a rage she flew! "Well, I’m always tired! I’m hot! I’m cold! I didn’t sleep last night! I’m fat! I’m ugly! I’m getting old! My clothes don’t fit me right! And I’d love to run away! So, for spite, I think I’ll stay! And I want to SCREAM again! That this "Change" is caused by MEN! While I’m going through pure hell! You think you’re so beguiling? You think I couldn’t tell? This is some cruel joke you play! It’s all your fault, no doubt! And she changes by the hour. She goes from sweet to sour! But I’ve been told, "This is a phase." They say, "This, too, shall pass." By the way, I love your web site AND the cartoon!! I wish you all the best! !I'll be a regular visitor to the Men's page!. "My sister-in-law was having night sweats and insomnia really bad. One night her husband in a half awake state and of course no glasses on, he said he was suddenly aware of a whooshing sound and could see red lights flashing as he looked towards his wife's side of the bed. He tells it like this "as I slowly woke up more, I realized Louise was fanning herself which made a whooshing sound and the red lights popping on and off were the numerals on the digital clock that he could see intermittently in between the waves of the fan." 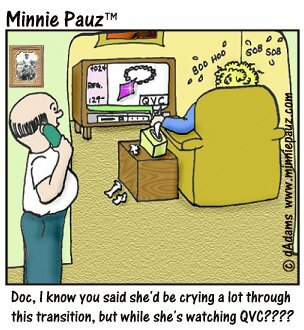 "This is Not Your Mother's Menopause"
Reviewer: David C. Mezzera from Vallejo, CA. I read this book after seeing the author on the "Today" Show this past summer. She presented such a sensitive and personal portrayal of menopause, a subject I had chosen to overlook while my wife was going through the change of life a few years ago. That led me to read the book in hopes of gaining an understanding and empathy for what my wife had gone through. The book indeed gave me an insight into issues such as hot flashes, headaches and lowered libido, so much so that I now wish my wife and I had read this book while she was menopausal. The non-HRT analysis in the book would have been important to her - the empathy gained from understanding the issue of menopause would be important to any significant other!